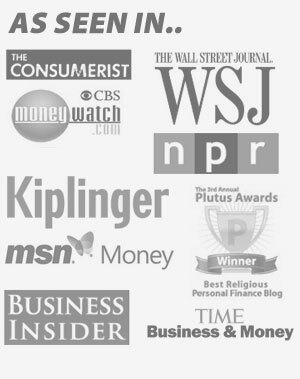 If you've found yourself in a situation where you're mired deep in debt, and aren't sure where to start, it's probably a good idea to do some research and look at debt reduction programs that other people have used in the past to relieve themselves of their debt as well. Why try to re-invent the wheel if you don't have to? Today I want to look at one such program, the debt snowball. Before getting into any debt reduction plan it's pretty important to first get an emergency fund saved. How much is up to you. You save an emergency fund so that life's little mishaps don't put you deeper into debt and short circuit any gains you've made. Depending on how much debt you have getting out of debt can be as quick as a few months, or it can take years. Most people are usually dealing with debt from things like school loans, car loans, credit card debt and ill advised payday loans. If you only have a few small debts, you can thank your lucky stars and be out of debt a bit quicker. Remember, the key here is that you are paying off your debts – because it is the right thing to do. You made those obligations, and you need to stick by them. Bankruptcy should only be entered into in a worse case scenario – and you're probably not there. 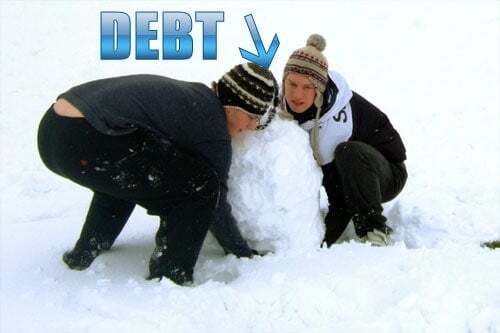 The debt reduction system called the Debt Snowball is the brainchild of financial guru Dave Ramsey. He put it together in his 7 Baby Steps program, and teaches it in his Financial Peace University™ class. So how does the Debt Snowball work? Once you've got all of your income, expenses and debt listed on your budget, follow these steps in the debt snowball to get rid of your non-mortgage debt. Put all your debts in order from the smallest balance to the largest. After your necessities are paid, pay the minimum payments on all of your debts. Put any surplus money towards paying off the smallest debt first. Pay off your smallest debt, get a psychological boost from knowing you're one step closer to being debt free! Once the smallest debt is paid off you roll the money you were paying on that debt over to the next largest debt. Wash, rinse, repeat until all your debts are paid off! Over the past few years there has been quite a bit of controversy surrounding the debt snowball. The reason? There are those that say that Dave Ramsey is bad at math and that the debt snowball isn't the best mathematical way to get out of debt. They say if you were to do it the BEST way, it would be to list your debts in order from the highest interest, to the lowest interest. Once they're in order you pay the minimums, and put any extra money towards the highest interest debt. Some have called this the debt avalanche. Mathematically their way IS the best way to get out of debt. Dave Ramsey has even admitted that the debt snowball isn't the best mathematical way to get out of debt. But he still pushes it as the BEST way to get out of debt. The reason he believes the debt snowball is still better is because it takes into account the psychology of debt reduction. His theory is that since you're paying the smaller debts off first you're getting a series of “quick wins” that give you that psychological boost you need in order to keep you motivated and keep you paying down your debts. The problem with paying the debts another way is that you don't get that psychological boost from the quick wins. Too often you'll end up burning out and giving up on debt reduction. The debt snowball is more sustainable, and gives you the best chance of succeeding. You may end up paying a little bit more interest, but they've found that you're more likely to actually succeed in paying off your debts with the debt snowball. I obviously come down on the side of the debt snowball in most cases. I know there are those that will still prefer to use the debt avalanche or another similar hybrid debt repayment scheme. The important part to me is that you take control of your finances and start getting out of debt. Whether it is the debt snowball, the debt avalanche or some other hybrid method, just get started on getting out of debt. Whatever works for you! If your debt snowball is going to be effective, you need to make sure you don't go into new debt, and continue paying down the old. Here are a few ways you can do that. Quit borrowing more money. No new debt! 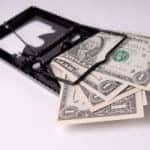 Cut up credit cards, and become credit card free. I know it may feel weird at first, but it's freeing! Sell stuff. You have more than you need or use, so sell it and put the money towards debt! Get an extra part time job. Take side jobs and earn extra income to accelerate paying off your debts. You won't be doing these jobs forever, they can be temporary. Get serious about paying off your debts, and take any extra money you have coming in, and put it towards your debts. You'll have them paid off in no time! What's your opinion of the debt snowball? Have you used it – or another system – to get out of debt? Tell us about it in the comments. Love me some Dave Ramsey. And love his Debt Snowball idea. It’s helped so many people get out of bad debt. Great introduction to the debt snowbal. I’ve read articles like this before but each time it makes me happy that even more people are getting such good advice. I have a question. Has anybody heard of the Money Merge Account program – through United First Financial. I received a call last week from a service by which I pay biweekly on my mortgage. The pitch had to do with alot of algorythems figured out by a group of MIT grads to help people get out of dept, save huge amounts of interest money, and do it in a lot less time without it affecting your budget??? It is such a great feeling to pay off a debt. I still remember the day we made the last payment on my wife’s card. We’ve never been so happy about cutting something! Yes, I have been a serious Dave Ramsey fan and have used this program for4 years now. Like most people, I overlooked this program because I thought I could handle things without help from others. After hitting rock bottom with check-n-go loan companies and the like, I surrendered to God and asked Him to guide me. THIS PROGRAM WORKS, IF YOU WORK IT! I’ve gone from pulling bills out of a basket, to just 2 larger ones, and will have them paid in a few years. One more thing, try to save up $500-1000 emergency fund before throwing extra funds toward the debts. If something breaks it is a cushion and keeps you from panicking and borrowing further in the hole. I hope this helps others.